Windows being multi user operating system, every user want to keep important files and folders invisible from other users. There are number of tools to hide files and folders on Windows 7, Vista and XP operating system. Hidden folders cannot be seen by other users and hence easily prevent access to hidden files, folders content. Right click on any file or folder and click on properties option. Then click to check “hidden” option and click Apply, OK. Specific file or folder will be hidden. 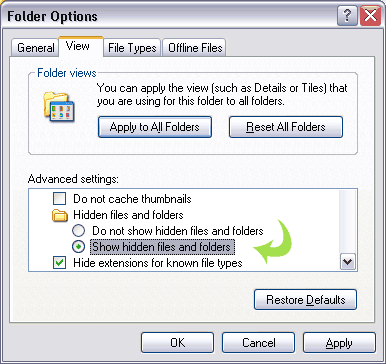 To view files or folders hidden using this method, you need to turn on ‘view hidden files, folder’ option: open any folder, click Tools > Folder Options. Click ‘view’ tab on Folder Options dialog box, check ‘show hidden files and folders’ option and click Apply, OK. While this method is easy, it is not fool-proof. Any user with knowledge of this Windows feature can view your hidden files and folder. For better protection, use free utilities to hide files and folders on Windows PC. WinMend Folder hidden is a free and very easy tool to hide files and folders with password protection. 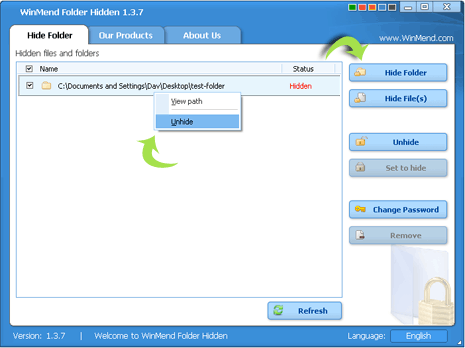 Download Winmend Folder hidden, after install enter any start password to open this program. Then click ‘hide files’ or ‘hide folder’ button and select any file or folder. To unhide selected file or folder: just open the program, enter login password, select specific file / folder and click unhide button. Simple, easy and very effective way to hide important files and folders. – My LockBox tool to hide files and folder on computer. Which is your favorite utility program to hide files and folders? Share with us your methods to turn files, folders invisible and keep them private!